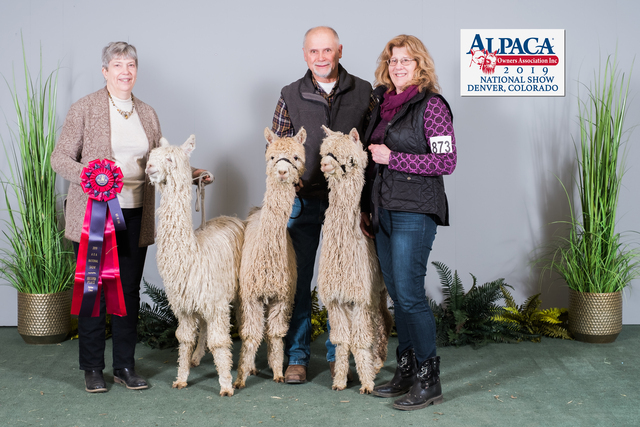 Big Timber is honored to co-own HFS Jeremiah with Tim and Beth Sheets of Heritage Farm Suri Alpacas. Jeremiah will be at our farm in Oregon in 2019 beginning in July thru the fall. Our first five offspring from Jeremiah were born in August 2018: three gorgeous males and two stunning females out of our stud females, Malika,Tahiti White Pearl, Kerolyn, Sweet 16 and Aphrodite. We are so happy with his offspring and can't wait until he is back in Oregon to breed our girls again. This beautiful, 3/4 Accoyo fawn female expresses the finest in the most sought after Suri traits: high level of luster, fineness and density, along with strong Accoyo conformation. Aphrodite's sire is one of the few solid color Accoyo males, Jax Accoyo High Roller, who won multiple banners in the show ring. Her dam is Ubers Tinker Bell, a multiple show winner also, with top Peruvian and Bolivian bloodlines. Matsudana is a stunning female sired by HFS Jeremiah and out of Aphrodite by Accoyo High Roller. This girl has it all: super fine, dense fleece and an incredible flat, twist/wave lock structure all on a strong, feminine frame. Her fleece is absolutely gorgeous with glistening luster and royale fineness. She inherited the best from her 7X Champion, Judges Choice sire, HFS Jeremiah, and her champion dam, Aphrodite. 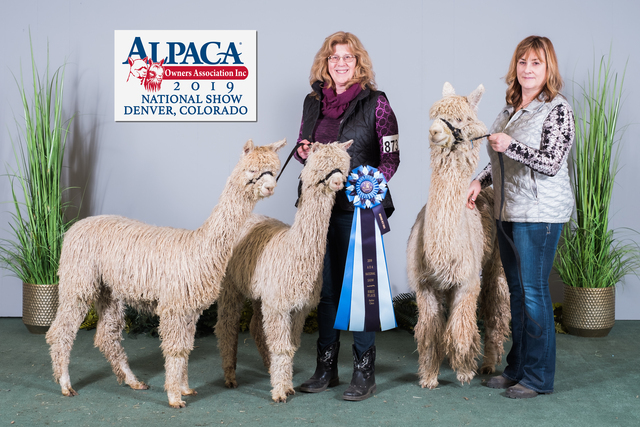 Both sire and dam are in the top 3% EPDs for many of the fiber traits. 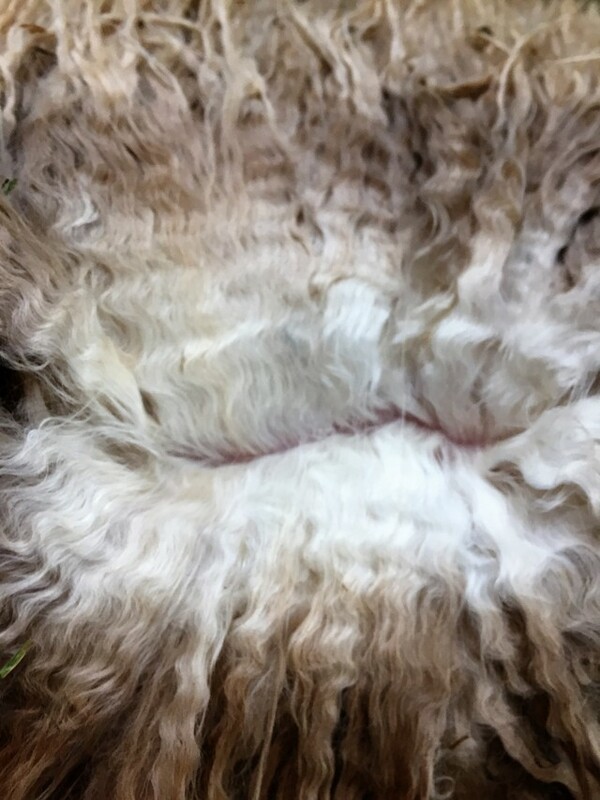 Aphrodite has top fiber density and uniformity stats with her skin biopsy as a mature 7 year old female showing a density factor of 64 follicles SQMM and a S/P micron spread of only 6 and a S/P ratio of 10 to 1. Her biopsy AFD at 7 years old was 20.25 micron. Matsudana's genetics are impeccable and include standouts such as Baron Lafite, Magnum, Rockstar, Torbio, High Roller and Jackpot. 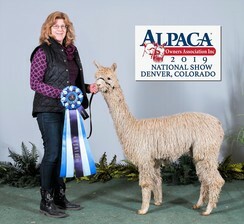 Matsudana made her show debut at the 2019 AOA National Halter Show in March. She placed first in her class!! 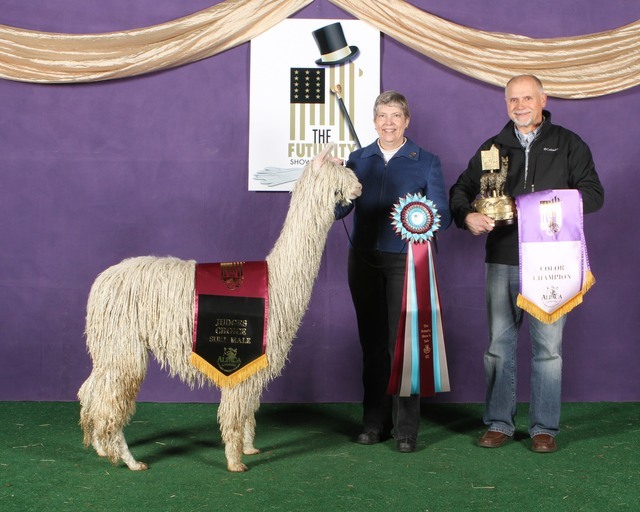 She was also in our first place Breeders Best Three group (with her half brother Kauri and our stud male Fyre Dancer) and our Jeremiah Get of Sire group (with Kauri). Pictures and words don't do her justice. She is simply stunning.